The study of ureteral pharmacology is in its infancy and the literature contains much confusing and conflicting information concerning the effects of drugs on the ureter. These data have led some workers to suggest that drugs in general have little or no effect on the ureter. To some extent the discrepancies in the available data are due to poorly controlled experimental procedures or to attempts to compare dissimilar functional responses of the ureter to a given drug. To assess the effects of drugs on the ureter it is necessary to consider (1) the physiologic responses being studied, (2) the experimental design of the studies, and (3) the mechanism of action of the drug being studied. 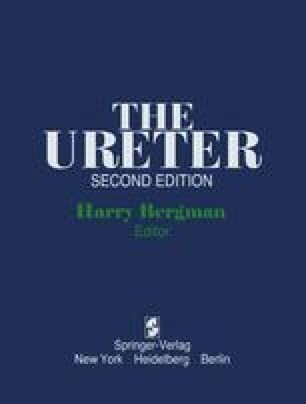 Although time will lead to changes in some of the information contained in this chapter, it is intended herewith to provide an initial basis for the understanding of drug effects on the ureter. No attempt will be made to analyze the validity of each individual pharmacologic study in the literature, but rather a brief, general review will be provided of the physiologic, pharmacologic, and biochemical properties of the ureter as they are affected by drugs.